Heat oven to 425° F. Place a rack on a rimmed baking sheet. Whisk the panko, 2 tablespoons of the oil, the seafood seasoning, and ¾ teaspoon pepper in a small bowl. Dip the chicken in the buttermilk in a bowl, then coat with the panko mixture, pressing gently to help it adhere. Place the chicken on the rack and bake until cooked through, 16 to 20 minutes. Cut into pieces. Meanwhile, whisk the Parmesan, lemon zest and juice, the remaining 3 tablespoons of olive oil, and ¼ teaspoon each salt and pepper in a large bowl. Add the romaine and tomatoes and toss. 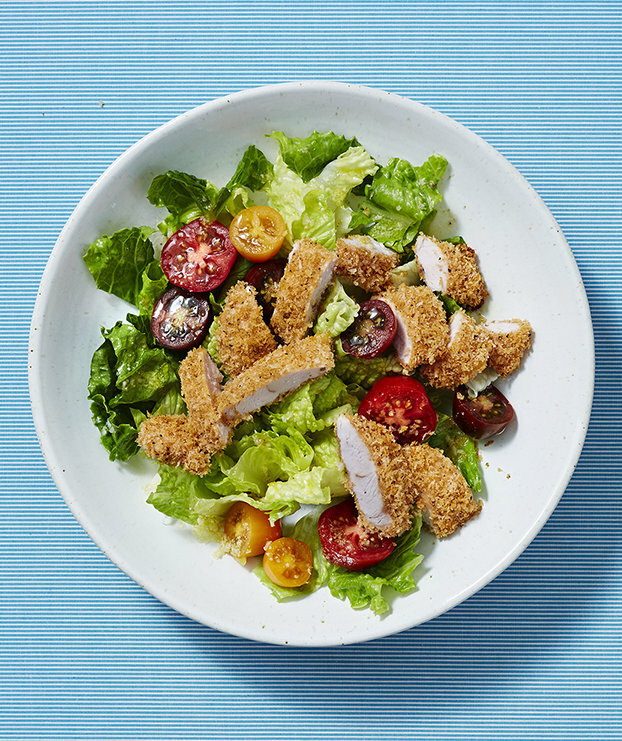 Serve the chicken over the romaine salad with additional Parmesan.